Shipping is limited to EMS for deliveries outside of Japan. With EMS, you can track the progress of the package online and insurance is included. Our current shipping and handling vary depending on the shipment place and total weight of the products that you order. Some countries charge import taxes to import goods from Japan. Buyers are responsible for payment of import taxes. Parabox doesn't take any requests from buyers to send it as a"gift." If you would like to have your package shipped to an address in Japan, we offer you the same shipping services and payment methods our Japanese website offers. All sales to addresses in Japan have sales tax applied. Payment must be made through Paypal. We will e-mail you auto made confirmation. The shipping department will e-mail you with a tracking number through Paypal within a few days, and then start packing up your order. If your order includes something out of stock, we will e-mail you right away. If your order includes Obitsu products which are stocked in our stores, it would cause a few days delay shipping in order to get them from Obitsu. If you would like to change your order afterward, please let us know as soon as possible. We will take care of it if it hasn't been shipped out. In the rare event a package is missing, damaged or delayed you may be compensated by EMS. Please send us pictures if your order was damaged when it arrived. This is how it works. Every time you purchase from the Parabox website, you receive points. You can use these points for your future purchases! *You will receive 1 point for every 100 yen purchase (the total price after discount, not including tax if applicable). *1 point can be used as 5 yen for your future shopping. 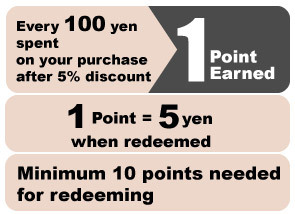 *You can use any amount of points minimum 10 points (equivalent to 50yen) up to 1,000 points (equivalent to 5,000yen) at one time for your future shopping. *You cannot use more points than the total amount of purchase price. Please verify that all the purchased items are correct when they arrive. If you receive wrong items or defective items, please let us know as soon as possible. Showing us pictures or videos of the problem would help us. Unless the problem was caused by Parabox, we will not accept return or exchange items. Please make sure that all the ordered items are correct when ordered. Please contact us using our contact form. Copyright 2004-2019 ZAI Ltd. All rights reserved.